Gerhard Gschwandtner, editor of Selling Power magazine, interviewed me recently regarding my new book, High-Profit Prospecting. Talking with Gerhard is more than an interview — it’s a quest into your inner self! Few people understand how the human mind works when it comes to sales as well as Gerhard does. Each time I’m with him, I find our discussions leaving me with many more things to think about. Let’s shift this a bit and now look at that from a sales perspective. What Gerhard is doing is what salespeople should be doing when speaking with a prospect to uncover needs. Those conversations should leave the prospect thinking. Watch the video and notice how we both agree about the need to fail fast and learn faster and the need to be uncomfortable. When we’re willing to be uncomfortable and to fail, we put ourselves in a position to increase our probability for success. 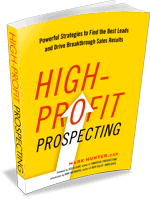 If you’re wondering if we discussed my book High-Profit Prospecting, yes we did, and in particular we discussed the problem too many salespeople have with thinking they have prospects, when all they have are suspects. I use the example a lot that just because a person will speak with you does not mean they’re a prospect. Prospects not only have needs, but they also are willing to divulge their issues with you. If you as a salesperson can’t create a level of confidence with the other person, then you have little chance of them ever revealing to you their critical needs. Are you willing to make yourself uncomfortable to be able to prospect more effectively? Being uncomfortable comes from being willing to try new strategies and new approaches to engage prospects. What are you doing differently this month from what you did last month? Success is not a constant. To be successful, we have to be willing to aggressively find new ways to sell more effectively.